so, we officially entered spring last week, but la seems to not want to fully transition into the new season. this weekend was chilly & rainy, which explains why i reverted back to dark colors - black & gray. this weekend...i was out & about saturday brunching @ la mill (love their frisee salad & iced chai latte) and doing some window shopping - a very typical saturday. sunday was raining which was perfect to stay in to organize my closet. i also was able to squeeze in a diy, which i can't wait to share with you! i'll be posting it this week, so follow on bloglovin' or facebook so you don't miss it! Hi Jin! 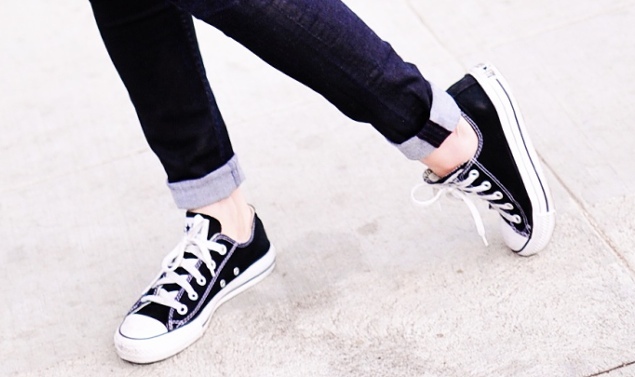 Cute combo with the phantom and chucks. :o) love your scarf!!! This look is perfect - chic and comfortable. Well, you've got some great diy ideas on your Pinterest board, so I can't wait to see what you tackled. I bet it's good. Happy Monday! there are so many diy's i want to try...but so little time. but, i did get to squeeze in a good diy...which i think you might like :) will be up soon!! !